What's new in my Wristcam pages? The first of the series. 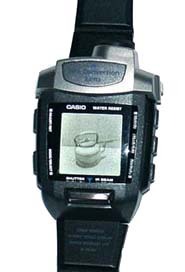 Introducing the "wrist camera" concept; the watch includes a grey-level digital camera (lens + video display). 24 characters available for comments with each picture. looses compatibility with LENS-1 "tele-lens" extension. On the right is the WQV-1 with the "LENS-1" module. This option is equivalent to a permanent 2x zoom position. Due to the different casing of the WQV-2, the LENS-1 only adapts on the first WQV-1 models. Brings colors to stored pictures! Introduces a very different design, not to be re-used in later models. 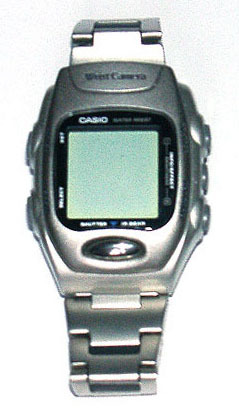 On the right : the WQV-3 in picture display mode. In order to appear on the 120x120 screen, only the central part of the 176x144 stored pictures is displayed. Color screen, digital zoom!! Aand back to the early, strange-looking design. 70 x 80 4096 color display! Pressing the central Shutter button in any mode -excepted IR- will switch to "record" (camera on) mode. 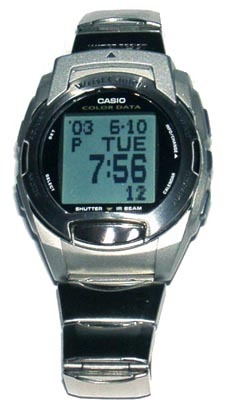 For power-saving purpose, a rest time equivalent to the previous recording duration is programmed. This means that after staying in record mode for, say, 20 seconds; the watch won't allow to re-enter record mode for another 20 seconds after leaving the last recording session. When attempting to access record mode before the rest time; a countdown displays the remaining waiting time as a countdown in seconds. 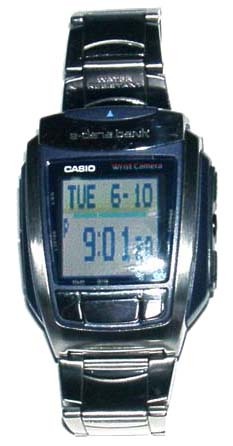 The watch then displays the number of available pictures for about 1.5 sec, then turns to record mode. Maximum recording time in a row is one minute. 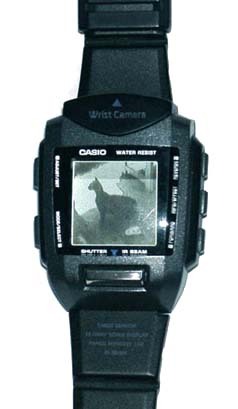 Depending on the watch model, it's possible to set the exposure mode and/or digital zoom position while in record mode, and watch the result live on the video screen. Pressing the Shutter button in record mode records the onscreen picture (screen freezes for a few seconds), then lets record mode on, allowing for more pictures to be taken (max 1 minute).